70 BRAVA MAGAZINE | MAY 2014 May 4 | 1 p.m. FLAG FOOTBALL FUNDRAISER Participate in the Alzheimer's Association's annual game with a unique twist: blondes vs. brunettes. Redheads are free agents. Only ladies play ball. Middleton High School, Middleton. act.alz.org. GO+DO CATALYST ON A MISSION: MAY EVENTS May 10 | 8 a.m. MARCH FOR BABIES Walk along to raise money for programs that help local moms have healthy, full-term pregnancies. Law Park, Madison. marchofdimes.com. May 17 | 7:30 a.m. WALK FOR DYSLEXIA Join to raise funds in support of the Children's Dyslexia Center in Madison, which will use the funds to provide free tutoring for local stu- dents. Vilas Park, Madison. walkfordyslexiamadison.org. PHOTOGRAPHED BY KAIA CALHOUN 100+ WOMEN WHO CARE SHOWING THE STRENGTH OF NUMBERS BY LEIGH MILLS, NBC 15 NEWS ANCHOR "THERE'S SO MUCH OPPORTUNITY FOR WOMEN TO DO SOMETHING POSITIVE IN JUST ONE HOUR." 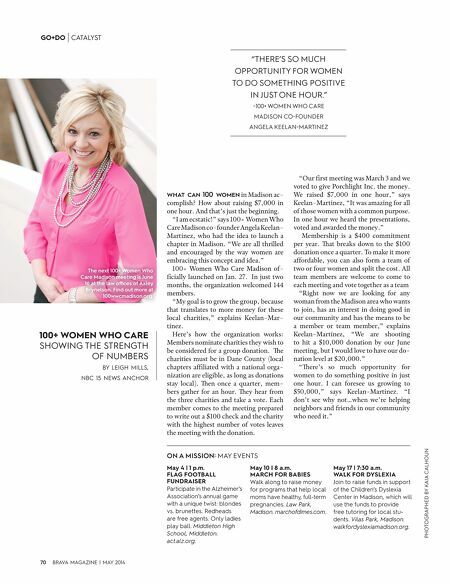 –100+ WOMEN WHO CARE MADISON CO-FOUNDER ANGELA KEELAN-MARTINEZ WHAT CAN 100 WOMEN in Madison ac- complish? How about raising $7,000 in one hour. And that's just the beginning. "I am ecstatic!" says 100+ Women Who Care Madison co-founder Angela Keelan- Martinez, who had the idea to launch a chapter in Madison. "We are all thrilled and encouraged by the way women are embracing this concept and idea." 100+ Women Who Care Madison of- ǠCIˬLLYLˬUNCHEDON+ˬN*NJUSTTWO months, the organization welcomed 144 members. "My goal is to grow the group, because that translates to more money for these local charities," explains Keelan-Mar- tinez. 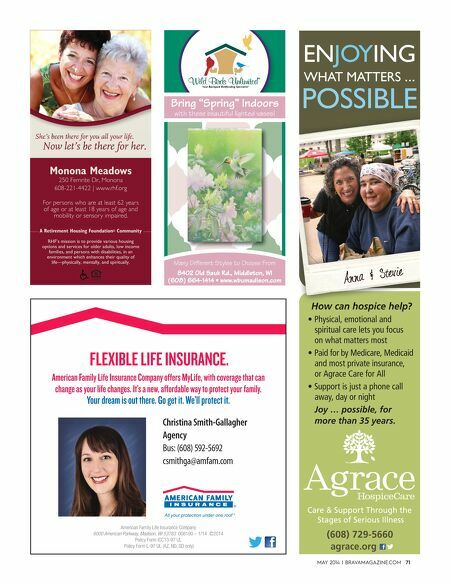 Here's how the organization works: Members nominate charities they wish to BECONSIDEREDFORˬGROUPDONˬTIONŀ E charities must be in Dane County (local CHˬPTERSˬǝLIˬTEDWITHˬNˬTIONˬLORGˬ nization are eligible, as long as donations STˬYLOCˬL ŀ ENONCEˬQUˬRTERMEM BERSGˬTHERFORˬNHOURŀ EYHEˬRFROM the three charities and take a vote. Each member comes to the meeting prepared to write out a $100 check and the charity with the highest number of votes leaves the meeting with the donation. n0URǠRSTMEETINGWˬS.ˬRCHˬNDWE voted to give Porchlight Inc. the money. We raised $7,000 in one hour," says Keelan-Martinez, "It was amazing for all of those women with a common purpose. In one hour we heard the presentations, voted and awarded the money." Membership is a $400 commitment PERYEˬRŀ ˬTBREˬKSDOWNTOTHE donation once a quarter. To make it more affordable, you can also form a team of two or four women and split the cost. All team members are welcome to come to each meeting and vote together as a team "Right now we are looking for any woman from the Madison area who wants to join, has an interest in doing good in our community and has the means to be a member or team member," explains Keelan-Martinez, "We are shooting TOHITˬDONˬTIONBYOUR+UNE meeting, but I would love to have our do- NˬTIONLEVELˬTo nŀ EREmS SO MUCH OPPORTUNITY FOR women to do something positive in just one hour. I can foresee us growing to $50,000," says Keelan-Martinez. "I don't see why not…when we're helping neighbors and friends in our community who need it." The next 100+ Women Who Care Madison meeting is June 16 at the law oﬃ ces of Axley Brynelson. Find out more at 100wwcmadison.org.